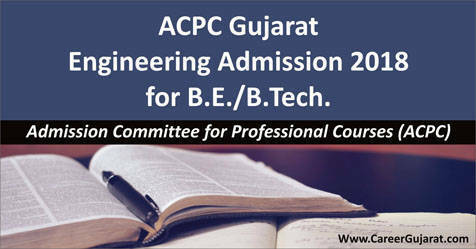 ACPC Gujarat Engineering Admission 2018 for B.E./B.Tech. Admission Committee for Professional Courses (ACPC) Ahmedabad has Released Advertisement For Admission in the First Year of Degree Engineering After Std. 12 (Science Stream) on State Quota Seats of Government, Grant-in aid and Self Finance Engineering Institutes and surrendered seats of management quota of Self Finance Engineering Institutes, Government of Gujarat has Decided to Carry out Web based Online Admission Process for the Academic year 2018-19. The Online Registration Through Internet is Mandatory for Participating in Admission Process. The Aspiring Candidates not having Internet Facility; can avail the Facility at Help Centre Designated by Admission Committee Without Paying any Charges. The List and Details of Help Centers and Bank Branches are Available on Admission Committee's website : www.jacpcldce.ac.in and www.gujacpc.nic in and in Admission Information Booklet. The Aspiring Candidates should have Passed Std. 12 (Science Stream) with Minimum 45% (40% for SC/ST and SEBC) in Three Subjects viz Two Compulsory Subjects i.e. Physics and Mathematics and any One of Optional Subjects i.e. (Chemistry / Biotechnology / Biology / Technical Vocational Subjects Prescribed by Respective Boards) from Single Board and Should have Appeared in GUJCET 2018 to Become Eligible for the Admission. Online Admission Process Carried Out by ACPC Consists of Three Phases : (1) Distribution of Booklet / PIN from Designated Branches of Kotak Mahindra Bank and Online Registration. (2) Preparation and Declaration of Merit & Online Choice Filling. (3) Admission Allotment & Confirmation.